© Posted on March 12, 2018, by Michael E. Newton. 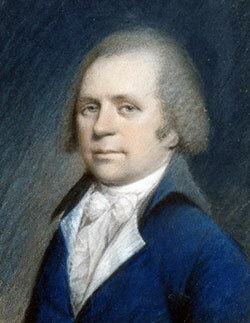 James McHenry, by James Sharples, c. 1796–1800, courtesy of Independence National Historical Park. According to this story, James McHenry not only attended Hamilton’s wedding, but he also penned a poem for the newlyweds. And this poem is often cited as proof that McHenry was in the room where it happened. The sole source for the story of James McHenry attending the wedding and writing the poem to celebrate the occasion is Bernard C. Steiner’s The Life and Correspondence of James McHenry, published in 1907. 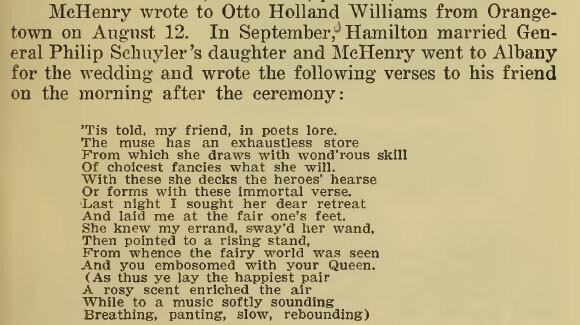 Steiner then included Hamilton’s reply to McHenry thanking him for his poetry. Neither of these items has been found since Steiner included them in his McHenry biography (see the citations in The Papers of Alexander Hamilton for the poem and Hamilton’s reply). So we must rely on Steiner for the contents and dates of these items. According to Steiner, the wedding of Alexander Hamilton and Elizabeth Schuyler took place in September 1780. 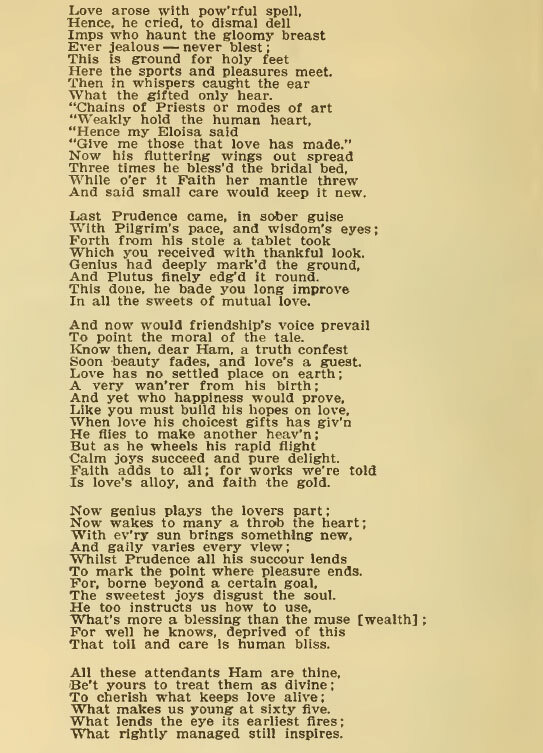 The poem, as printed by Steiner, has no date. Hamilton’s reply has a date of “Sep. 12. .” In other words, Hamilton’s reply has a date of September 12, but it would seem that no year was recorded. Steiner apparently added the “” because that is the year he thought the wedding took place and he also thought the poem and reply were related to that event. Accordingly, if the year was not written on the reply and was added by Steiner, it is possible that the poem and Hamilton’s reply were not written in 1780, though they could have been. McHenry’s Poem Related to Hamilton’s Wedding? As we know, the wedding of Alexander Hamilton and Elizabeth Schuyler took place in Albany on December 14, 1780, not in September 1780 as Bernard Steiner wrote. If Hamilton wrote to McHenry on September 12, 1780, or some other year, to thank him for his poetry, McHenry’s verses have nothing to do with Hamilton’s wedding. And if the poem had nothing to do with the wedding, no evidence has been presented by Steiner or anyone else placing McHenry at the wedding. Perhaps Steiner was correct about these two items being related to Hamilton’s wedding but simply gave the wrong date in his book, as asserted by The Papers of Alexander Hamilton. This seems unlikely because both the month and day are presented by Steiner as if taken straight from the original and it is unlikely that he misread or changed both of them. In other words, there is no reason to ignore the printed date given by Steiner just to make the poem and reply fit the corrected timeline. Furthermore, neither the poem nor Hamilton’s reply mentions the wedding. Hamilton didn’t even mention his new wife in his reply to McHenry, as he did in a letter to Washington on December 19, written during the same period that, according to The Papers of Alexander Hamilton, Hamilton wrote his reply to McHenry. In other words, there is no evidence that McHenry’s poem and Hamilton’s reply have anything to do with the wedding. In fact, the evidence we have—the date given by Steiner—says that they did not. It is possible, however, that Bernard Steiner had another source placing McHenry at the wedding, even though he did not cite this source and had the wedding taking place at the wrong time. So even if McHenry’s poem and Hamilton’s reply had nothing to do with Hamilton’s nuptials, we cannot yet dismiss the story of McHenry attending Hamilton’s wedding. Where was James McHenry on the day of Alexander Hamilton’s Wedding? Unfortunately, there is nothing written by James McHenry in the James McHenry Papers at the Library of Congress on this date or for several weeks before or afterward, nor have any drafts by him for Lafayette, for whom he served as an aide, been found for the period between September 1780 and January 1781. Other than the poem by McHenry and Hamilton’s reply, both of which were misdated, there is no reference to McHenry during this period in Founders Online, which includes the correspondence of Washington, Hamilton, Adams, Jefferson, Madison, and Franklin. Nor have I found anything about McHenry’s whereabouts during this period in the writings of Nathanael Greene, Lafayette, Philip Schuyler, John Jay, the delegates to Congress, and numerous other contemporaries. James McHenry apparently was with Lafayette at the “Light Camp near Totowa, on the Passaic,” in New Jersey, on November 19, 1780. The Marquis de Chastellux wrote that James McHenry travelled with him from the light camp to Washington’s headquarters at the Dey Mansion in Preakness (now Wayne), New Jersey, on November 23. McHenry was at Lafayette’s “Head Quarters” in Morristown, New Jersey, on December 28, 1780. I found no record of McHenry traveling with his commander Lafayette, Chastellux, and others to and from Philadelphia in November and December 1780 despite the numerous accounts of this journey. On the other hand, I found nothing placing McHenry with the army in New York or New Jersey or traveling to Albany. In sum, I found no record of any sort regarding McHenry between November 23 and December 28, 1780. Without knowing James McHenry’s location during this period, one cannot say with certainty whether he attended the wedding of Alexander Hamilton and Elizabeth Schuyler in Albany on December 14, 1780. While we cannot prove that McHenry did not attend, there is no evidence that he was there. Without a single shred of evidence to support the story, I must conclude that James McHenry probably did not attend the wedding. But if one wants to believe that he was there, one should write that McHenry possibly or reportedly attended the wedding but should not present it as a certainty. I hope that somewhere there exists an undiscovered letter by McHenry or an unpublished letter or diary that reveals his whereabouts on this date. Until this is discovered, the uncertainty remains. Hamilton was in New Bridge, New Jersey, on September 12, 1780. Lafayette in the Age of the American Revolution, Vol. 3. Yes, I started to question McHenry’s attendance at Hamilton’s wedding several years ago. Lafayette to Benjamin Franklin, November 19, 1780, duplicate in James McHenry’s hand, in Lafayette in the Age of the American Revolution 3:228–230. One assumes this copy was made at the time, but it is possible that it was made later. Chastellux, Travels in North America (ed. Howard C. Rice) 103–105, 275 note 1. James McHenry to Mr. Von Riper, Wayne MS, 11-86, MS Division, Historical Society of Pennsylvania. McHenry gives his location as “Head Quarters,” but the contents of the letter make it clear he was in or near Morristown. For instance, see Chastellux, Travels in North America (ed. Howard C. Rice) 106–223; Gottschalk, Lafayette and the Close of the American Revolution 153–161.